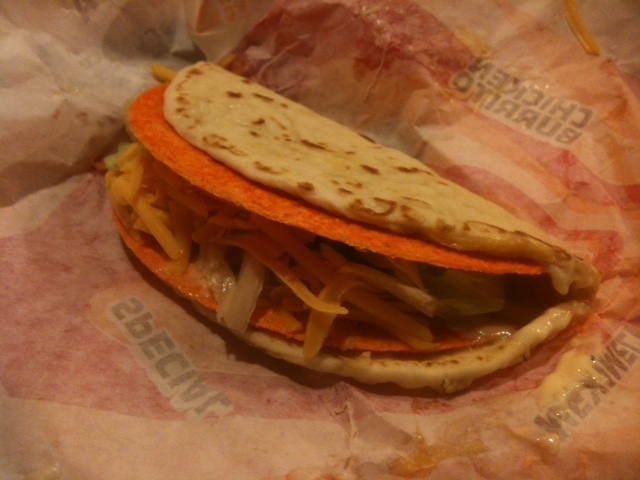 I suspect with some experimentation the Doritos Locos Taco shell might prove a valuable Taco Bell ingredient in other incarnations: A Cheesy Doritos Gordita Crunch would probably be amazing, for example. As it turns out, I was right. (It’s almost as if I have great Taco Bell instincts by now.) The Gordita wrapper prevents the dry-tongue issue that plagues the regular Doritos Locos Taco, and the Dorito flavoring, in turn, adds a nice bit of spicy cheesiness to the already awesome Cheesy Gordita Crunch. I’ve only had one of these to date, but I might even suggest that this creation is better than the two that inspired it — a strong endorsement, since the Cheesy Gordita Crunch is my favorite thing on the menu. Our man Catsmeat, I should note, has enjoyed this Taco Bell Frankenstein before. And I’ve even noticed the Taco Bell Twitter account recommending people try it. The guy behind the counter at the 14th St. Taco Bell didn’t act like my order was anything special. But since I’m on the subject, and because it’s Taco Bell Tuesday, I figured I should mention a series of coincidences that I’m sure is just that, but which is strange enough to have me at least considering otherwise. OK, so you know that I suggested the Cheesy Gordita Doritos Locos Crunch in my original review of the Doritos Locos Taco, and then a short while after, someone at Taco Bell started recommending it via Twitter. But consider this, too: I have mentioned on multiple occasions on this site and in the comments section that my wedding party went to Taco Bell between the wedding and the reception. Now there is a Taco Bell commercial featuring a wedding party, in full wedding regalia, enjoying Fourthmeal. Back in April (and perhaps before that, too) I noted that a Ramon Castro foul ball once ricocheted off Citi Field’s second deck and into my dad’s nachos. Taco Bell’s new Beefy Nachos Burrito is advertised with commercials showing a fan at a baseball game catching a foul ball because he does not have to hold his nachos. And — and! — you may have seen Taco Bell’s first bunch of Live Mas commercials, mentioning a Taco Bell fan named Nat Christiano who drove to Toledo, Ohio to try the Doritos Locos Taco. That’s this guy. Catsmeat tipped me off to that video the day Nat posted it, and if you look at the statistics for the video on YouTube, you’ll see that its first “significant discovery event” was the time I embedded it on this site. Again: I am almost certain that this is just a series of coincidences. Every one of Taco Bell’s actions could be explained pretty easily without my involvement, and I doubt anyone in Taco Bell’s marketing department is reading this site, trolling for ideas. But just in case: Are you listening, Taco Bell? If you are, please contact me. We could have something beautiful here.